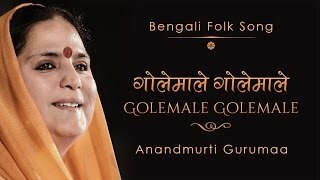 This video features revered master Anandmurti Gurumaa’s mesmerizing rendition of the melodic song Golemale Golemale Pirit Koro Na, from Bengal, the land of the Bauls. As it is human nature to love, this song is a reminder to not fall in love hurriedly and unknowingly because love is like the glue of a jackfruit which does not come off easily once it gets stuck. Thus, loving without knowing the true form of love could be a huge mistake, just like an ant stuck in jaggery that cannot even move.